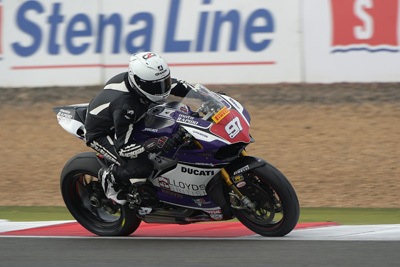 JOSH Corner was thrown in at the deep end at Silverstone – but emerged happy and smiling after finally getting to grips with a brand new motorcycle in Sunday’s Pirelli National Superstock 1000 race. The 18-year-old from South Shields was standing in for sidelined South African James Egan on the MWR Motorsports Ducati Panigale R in the penultimate round of the year, and had never ridden the bike until Friday morning. Although it took him a few sessions to get used to the completely different machine – this was the first time he has ever ridden a Ducati – he ended the weekend with a much better feel for the bike. After qualifying in 32nd place, he got a good start and was up to 27th by the end of the first lap. From here he was able to use everything he had learnt during the free practice and qualifying sessions. He began to pick his way through the field, making up another 10 places during the 11-lap race to cross the line 17th, and just missing out on a points finish. “I’m really pleased with how the race went,” he said. “The weekend started off a bit difficult having never ridden the bike and trying to get a set up as well. But as the weekend went on I got more confident on the bike and felt more comfortable. “I’m pleased with my result and looking forward to Brands now. Thanks to Mark at MWR for sorting this out for me and Moto Rapido, Ducati UK and team sponsors Pawson Commercials. Team boss Mark Webster added: “I knew from the start it would be a very difficult weekend for Josh, jumping on a bike for the first time at a race meeting in a class he had only ever ridden in once before as well as not riding any sort of bike for five months. “But I did not choose Josh to ride the bike without knowing what he is capable of and the talent he has at such a young age and he didn’t let me down. Josh will ride the MWR Motorsports Ducati again at the final round at Brands Hatch in two weeks’ time.